On behalf of the members of the Assembly Committee on Higher Education, I respectfully submit to you the Committee's 2003 Annual Report which highlights our activities over the last year. The 2003 Legislative Session was a productive one. The laws which were enacted this year through the Committee's efforts reflect the varied mandate of the Higher Education Committee. Throughout the budget process the Committee worked to ensure that vital higher education programs were adequately funded and that students were not shortchanged. The Governor's proposal to slash $262 million from the TAP Program was rejected, $36.9 million in additional funding was provided for vital educational opportunity programs and $79.4 million was restored to preserve base aid for community colleges. Unfortunately, we were unable to formulate a capital plan for SUNY and CUNY as the Governor failed to provide a detailed capital plan for SUNY and CUNY even after repeated requests from the Assembly Majority. The Assembly's efforts to obtain a comprehensive plan from the Executive included two public hearings to underscore the need for a capital plan. While any increase in tuition at the State and City university systems presents a challenge to students and working families, the Assembly Majority ensured that the SUNY Trustees' proposal for a $1,400 increase was reduced by one-third, to no more that $950 per resident student. The Committee's work was not limited to fiscal concerns, however. In fact, the 2003 Legislative Session addressed many pressing issues. The State Education Department (SED) is now empowered to take direct action against individuals who seek to defraud and endanger the public by illegally practicing a profession. This law underscores that public protection is the paramount concern when statutory changes affecting the State's licensed professions are enacted. Colleges and universities will be required to implement policies and procedures to assist in maintaining a safe and secure environment and in preventing campus crime in general and bias-related crime in particular. Greater security and crime prevention will be provided at the community college campuses, whose boards will now be authorized to designate peace officers. Access to textbooks for students with disabilities will be improved through a measure requiring publishers to provide electronic versions of printed educational materials at a cost comparable to the printed version. Much has been accomplished this year, but much still remains to be done. Thank you for your leadership and steadfast support of our State's higher education community. I am proud to have had the opportunity to work with you and my colleagues toward our shared goal of ensuring that our system of public and private higher education remains the best in the nation. The Committee on Higher Education is primarily responsible for the initiation and review of legislation relevant to higher education and the professions in New York State. Formally, the Committee is concerned with policy initiatives affecting the State University of New York (SUNY), the City University of New York (CUNY), the independent colleges and universities of New York, proprietary vocational schools, student financial aid, and the licensed professions. However, because of the complex and comprehensive nature of New York's system of higher education, the Committee has also been involved in shaping legislation in such diverse public policy fields as health care, economic and workforce development, technology, capital financing, and elementary and secondary education. In addition to providing support to the state-operated campuses of SUNY and the senior college programs of the City University, New York State contributes financially to community colleges and provides direct aid to independent colleges and universities. The State also demonstrates it commitment to higher education through funding the country's largest state-supported TAP. The Committee on Higher Education also monitors the ongoing activities of the 44 professions which SED is charged with licensing and regulating. Through careful consideration of legislation affecting the professions and through the monitoring of the professional discipline functions of the State Education and Health Departments, the Committee endeavors to protect the health, safety and welfare of the public and to ensure the maintenance of high standards and competence within the professional realm. This report summarizes the activities and achievements of the Assembly Committee on Higher Education in each of its major areas of responsibility during the 2003 legislative session. The 2003-04 Executive Budget proposed a total of $703 million in cuts to Higher Education. Included in these cuts was a $1,200 tuition increase, a decrease in funding for the Tuition Assistance Program (TAP) in the amount of $262 million, a 50 percent cut to several Opportunity Programs and a 15 percent per Full-Time Equivalent (FTE) decrease in base aid for SUNY and CUNY Community Colleges. Failure to come to an agreement with the Executive resulted in a bipartisan budget that restored many of these cuts to Higher Education. Though the Governor vetoed each of these budget bills, the Legislature managed to override each of these vetoes leaving the Higher Education budget passed by both houses intact. This year, the Executive proposed decreasing the state support for each FTE student by $345 for community colleges. Base aid constitutes the State's responsibility in its share of community college financing and is divided among the schools through a formula that accounts for each FTE student. Recognizing the importance of the State's support of community colleges, the Assembly has provided additional academic year funding of $54.1 million for Community College base aid. This maintains the State's share of community college financing at $2,300 per FTE. In addition to maintaining base aid levels, the Assembly also worked to maintain funding for other important programs that exist at community colleges. Recognizing the increase of adult nontraditional students at these schools, the Assembly provided $3.4 million for the expansion of existing childcare services at both the State and City Universities. These programs allow working parents to attend school and improve their families' futures, and thus will remain priorities for the Assembly in the 2004 budget negotiations. The Assembly secured $190,000 for the College Discovery Program and $2.76 million for the Search for Education, Elevation and Knowledge Program (SEEK) at CUNY (SEEK), which restored funding levels to those provided for in 2000-01. Funding for the opportunity programs has been an ongoing struggle that dates back to 1995, when the Governor first proposed their elimination. Access to public universities continues to be a high priority for the Assembly Higher Education Committee. In 1995, the Executive proposed eliminating highly successful access and opportunity programs at SUNY and CUNY. Each year for the past eight years the Legislature has worked to restore these programs for the educationally and economically disadvantaged. Three years ago, the Legislature was successful in restoring each of the programs to their 1994 level. While that funding increase did not reflect the rate of inflation over the past several years, the base budget for these programs no longer contained a 25 percent cut across the board. This year's budget maintains last year's funding levels. The Executive proposal to eliminate the Science and Technology Entry Program (STEP) and the Collegiate Science and Technology Entry Program (CSTEP) was rejected by the legislature and funding was fully restored to SFY 2002-2003 levels. Additionally, the Executive proposal eliminated funding for the Education Opportunity Program (EOP). The legislature also rejected this proposal and funding was restored to the 2002/2003 levels in the amount of $5.4 million. Funding secured by the Assembly for STEP, CSTEP and EOP will provide a solid foundation for these vital services. The State of New York provides Unrestricted Aid to Independent Colleges and Universities (Bundy Aid) each year to enhance its commitment to private colleges and universities. This year the Legislature rejected the Executive's proposed 50 percent reduction to HEOP. Keeping its commitment to help disadvantaged students gain access to private colleges, the Committee was able to provide $11 million to fully restore state support to 2002-2003 levels. New York State is fortunate to have the most diversified and largest independent sector of higher education in the nation. According to the Commission on Independent Colleges and Universities (CICU), in 2001 26 percent of the students enrolled in the Independent sector in New York State were minorities. The independent colleges and universities of this State enroll 440,522 students. New York not only boasts the nation's largest private university, New York University, it also prides itself on numerous excellent, small colleges as well. In many instances across the State, a college or university is the major employer in the community. Therefore, a strong independent sector of higher education helps the New York economy in several respects -- through educating its work force, as an employer, and through the ancillary services in the community that cater to the student and staff population. Independent campuses throughout New York State have a collective annual economic impact of $40.2 billion, employ 131,000 New Yorkers and have a $6 billion payroll. New York State is fortunate to have the most comprehensive system of financial aid in the United States. At the forefront is the Tuition Assistance Program (TAP), which assists thousands of students attending college each year. The Assembly Higher Education Committee is committed to keeping college affordable for students. The 2000 Assembly budget contained several comprehensive enhancements to the TAP Program, including increases in both maximum and minimum awards and the increase of income eligibility to $80,000. Unfortunately, rather than seeking to build upon this foundation, the Executive proposed a restructuring of the Program that was coupled with a $262 million cut. The Assembly again rejected the restructuring proposal, which was first presented in the 2002-2003 budget. The proposal would have slashed one-third of each student's award, forcing many of those least able to afford increased debt to seek additional loans. The proposal would have had the State retain one-third of each award to be payable upon graduation as a "performance award." Access to higher education opportunities has been a long-standing concern of this Committee. Over the years, the Legislature has created programs which provide special assistance to educationally and economically disadvantaged students, underrepresented groups, and "at-risk" youth--students who require additional support in order to achieve academic success. The Assembly has been committed to ensuring all students access to higher education and enhancing their academic success through the support of access programs. The Teacher Opportunity Corps (TOC), the goal of which is to attract more African-Americans, Hispanics, and Native Americans to the teaching profession and to prepare these individuals to work effectively with students who are at risk of academic failure and dropping out of school. The TOC is also considered to be a model of excellence for teacher education programs. The State provides small awards for Native Americans pursuing post-secondary study in New York. This access program offers financial aid to eligible Native Americans and has been critical in addressing the under representation of this population in New York State's higher education system. New York State has 36 public community colleges: 30 within the State University system and six within the City University system. With a total enrollment of 257,000, community colleges provide a primary source of access to higher education opportunities. The community colleges of SUNY and CUNY are referred to as "full opportunity" institutions, accepting all recent high school graduates and returning residents from the colleges' sponsorship areas. A.7468-A, Canestrari; Chapter 268 of the Laws of 2003; This Chapter reduces the terms of appointed members of the State University community college boards of trustees from nine to seven years. This provision seeks to address the concern that the length of the terms of community college boards of trustees prevents the attraction of dedicated and qualified candidates. Because the community college boards of trustees are unpaid volunteer positions, a term of seven years was considered to be more appropriate. Additionally, this Chapter seeks to address the concern that a longer term inhibits the accountability of office holders. A. 2317-B, Destito; Chapter 689 of the Laws of 2003; This Chapter authorizes the Board of Trustees of a community college and a community college Regional Board of Trustees to designate peace officers for their respective campuses. Prior to this law, community college security personnel did not have law enforcement powers. Consequently, local police were required to respond to incidents involving arrest and detention placing undue constraints upon public resources. This law seeks to remedy this problem by allowing the Board of Trustees of a particular campus to appoint peace officers. Within one year of being appointed, peace officers would be required to complete a training course approved by the Municipal Police Training Council in consultation with the State University Board of Trustees. As with many other peace officer categories in this State, community college peace officers with a pistol permit would be allowed to carry a firearm. Although this Chapter extends to peace officers the authority to execute arrest and search warrants, a Chapter amendment was submitted by the Executive that would remove this provision from current law, ensuring that the powers of this class of peace officers are consistent with those of other peace officers. Founded as the Free Academy in 1847, the City University of New York (CUNY) has grown into the largest urban university in the nation. CUNY is also the third largest university in the country and is comprised of 20 campuses throughout Queens, Brooklyn, Manhattan, the Bronx and Staten Island. It includes 10 senior colleges, a two-year preparatory medical program, a law school, a graduate center, and six community colleges. Through this network, CUNY provides educational opportunities and skills training to an ethnically and culturally diverse population of approximately 208,862 students annually: 140,818 at the senior colleges and 68,044 at the community colleges. The State University of New York is the largest public university system in the nation, embracing 64 distinct individual colleges located in urban, suburban and rural communities across New York State. These 64 units offer a full range of academic, professional and vocational programs through its university centers, comprehensive colleges, colleges of technology, and community colleges. The State University system enrolls approximately 383,000 students in over 5,180 programs of study which are available. A.7517, Canestrari; Chapter 590 of the Laws of 2003; This Chapter seeks to address the issue of bias related crime on college campuses. In recent years, several incidents took place at a particular SUNY Campus that were directed against a specific religion, race or nationality. The law requires all colleges and universities in New York State to inform incoming students about bias related crime prevention measures including applicable laws, ordinances, and regulations as covered in the Hate Crimes Act of 2000, the penalties for commission of bias related crimes, the procedures in effect at the college, the availability of counseling and other support services, the methods the college employs to advise and update students and the nature of, and common circumstances relating to, bias related crime on college campuses. A. 8511-A, Tokasz; Chapter 597 of the Laws of 2003; This Chapter makes a technical correction to existing statute relating to conduct on campuses of institutions of higher education. Additionally, this law seeks to enforce current statute by adding a section that requires colleges to, upon request, inform individuals how to obtain campus crime statistics that are filed annually with the U.S. Department of Education. A.6216-A, Stringer; Chapter 219 of the Laws of 2003; This Chapter seeks to guarantee that students with disabilities have full access to instructional materials used in colleges in New York State. This law requires publishers and manufacturers of printed instructional materials for college students in New York State to also make available electronic versions of such materials. The electronic versions of these publications must be sold at a comparable cost to the printed version, so as to ensure access. A.8572, Tonko; Chapter 328 of the Laws of 2003; This Chapter seeks to increase the amount permissible by law to be invested in a general account funding agreement by the College Choice Tuition Savings Program. General account funding agreements, types of contracts issued by insurance companies, are justified by their relative safety. Currently, any fund assets that exceed 15 percent are invested in the U.S. Treasury obligations which are on the legal list of specific authorized investments. This law permits general account funding agreements to be added to the legal list of authorized investments. A.8573, Tonko; Chapter 593 of the Laws of 2003; This Chapter seeks to make certain changes to the New York State College Choice Tuition Savings Program Act in order to conform it to federal law. At the time of inception, this Program incorporated all necessary components of the federal tax code in order to ensure conformity. Since then, several changes have been made to the relevant Internal Revenue Code. This law simply makes the necessary changes so that the program remains consistent with federal law. A. 8571, Brodsky, Chapter 98 of the Laws of 2003; The New York State Tuition Reimbursement Account provides a tuition refund to students at proprietary schools in the event that their schools close or do not properly administer their educational program. When the balance of this account exceeds $1.5 million, the additional funds are then transferred to the Bureau of Proprietary School Supervision Account to assist in SED's oversight of the proprietary school sector. This Chapter extends the expiration date relating to the authorization of the transfer of funds from the State's Tuition Reimbursement Account to the Bureau of Proprietary School Supervision Account until December 1, 2007. A.4619, Sweeney; Chapter 609 of the Laws of 2003; This Chapter relates to an academic incubator already in existence at SUNY Farmingdale. This law authorizes SUNY to establish an account to receive lease payments from leases of the pharmaceutical and technology/manufacturing building and transfer to the account payments related to the academic incubator. A. 8800, Canestrari; Chapter 151 of the Laws of 2003; This Chapter authorizes salary deductions by municipal employees for the benefit of college foundations of State-operated campuses of the State University and college foundations of community colleges operating under the program of the State University. This law will support the fund-raising activities of these college foundations which promote academic program enrichment, student scholarships, faculty development and campus endowment programs. A. 9003, Rules Committee; Chapter 457 of the Laws of 2003; Prior to this law, the New York SED measured the academic progress of students attending not for profit business schools in New York State in clock hours as opposed to credit hours. As a result, many students were not eligible to receive federal financial aid that otherwise would have been available to them. This Chapter seeks to remedy this problem by authorizing not for profit business schools that participate in TAP to measure academic progress in credit hours, solely for the purpose of calculating federal financial aid. New York State currently licenses 44 professions under Title VIII of the Education Law. Legislation to license a new profession or to alter the practice of an existing profession falls under the jurisdiction of the Committee on Higher Education. SED, through its Office of the Professions, regulates the practice of the professions authorized under Title VIII on an ongoing basis. Some professions are not licensed, but certified. The distinction made between licensure and certification in the Education Law is that licensure protects both the title and practice of a profession, while certification protects only the title. Both require that standards of education, examination, and experience are met to assure the public that those individuals achieving licensure or certification are qualified. A. 781, Grannis; Chapter 653 of the Laws of 2003; This Chapter amends the statute which regulates the manner in which veterinary records may be released. Under previous law, veterinarians were not able to disclose medical records without the consent of the animals' owners. As a result, many veterinarians were reluctant to release such records to the police, SPCA's, the Department of Health or other appropriate agencies without fear of civil or criminal prosecution. This Chapter seeks to remedy this problem by allowing veterinarians to release medical records of animals they treat, if, in good faith, they suspect the animal is the victim of abuse or if they reasonably believe that the release of medical records is necessary to protect the health and welfare of the animal. A. 1041-B, Canestrari; Chapter 615 of the Laws of 2003; This Chapter seeks to enhance the enforcement of existing statutes relating to licensure of the professions by authorizing SED to take certain actions against individuals engaged in the unlicensed practice of a profession. Prior to this law, such cases were referred solely to the Attorney General for prosecution. This law seeks to expand the opportunities for prosecuting cases of illegal practice by extending the authority to seek injunctive relief against such individuals to SED and, in addition, provide a means for SED to issue cease and desist orders, civil restitution and penalties. A. 978, Lopez; Chapter 269 of the Laws of 2003; This Chapter seeks to enhance the protection of the public by requiring chiropractors to complete 45 hours of professional continuing education every three years in order to remain eligible to practice chiropractic in the State of New York. A.5580, Canestrari; Chapter 583 of the Laws of 2003; This Chapter seeks to clarify that respiratory therapy services may be provided by a licensed respiratory therapist pursuant to a prescription from a primary health care practitioner authorized to make such referrals. The Respiratory Therapy Practice Act does not specify that respiratory therapy practitioners may render services pursuant to a referral from a non-physician health care provider while practicing under the direction of a physician. This law seeks to remedy this ambiguity. A.6458A, Magee; Chapter 558 of the Laws of 2003; This Chapter extends for three years a provision of law which would otherwise have expired on December 31, 2003. This statute will continue to permit all qualified individuals to seek licensure in veterinary medicine or veterinary technology, regardless of citizenship or residency status. This measure seeks to address the current shortage of qualified veterinarians and veterinarian technicians in New York State. A.7268, Englebright; Chapter 410 of the Laws of 2003; This Chapter amends the existing statute regarding the continuing education requirements for land surveyors by exempting land surveyors from the continuing education requirement during their first triennial registration period. A.6961-A, Canestrari; Veto 154; This bill would have prohibited the alteration of the plans, specifications, plats, reports or drawings produced as the result of a land survey performed by a licensed land surveyor. Currently, land surveyors are permitted to selectively modify the surveys of others, a practice that is not always in the best interest of the public. This bill would have provided an exception for licensed engineers, who may alter surveys and other such items within their scope of practice. Unfortunately, the Governor saw fit to veto this legislation, citing concerns that the bill goes too far in proposing an absolute ban on the alteration of land surveys. The Governor advises SED to use enforcement action to ensure that land surveys are only altered in an appropriate manner. Additionally, the Governor advises that additional regulations be considered in seeking a resolution to the problem. A.8506, Pretlow; Chapter 433 of the Laws of 2003; This Chapter seeks to make a technical correction to Chapter 420 of the Laws of 2002 which created licensure requirements for master social workers and licensed clinical social workers. This provision provides a temporary exemption to employees of the Office of Children and Family Services (OCFS), allowing for a longer implementation period. A.8578, Cahill; Chapter 508 of the Laws of 2003; This Chapter extends for three years a provision that exempts qualified candidates for licensure from the citizenship and residency requirement. This measure seeks to address the current shortage of qualified pharmacists in New York State. The length of time involved in obtaining citizenship or permanent residency status often prohibits qualified candidates from becoming licensed. This measure will allow such candidates to obtain licensure while at the same time pursuing citizenship or permanent residency. A.8987, Paulin; Chapter 160 of the Laws of 2003; This Chapter seeks to address a concern that has arisen over whether regulations promulgated by the Office of Children and Family Services (OCFS) that permit unlicensed staff at regulated daycare programs to administer medication to children in their charge conflict with the provisions of the Education Law that limit the administration of medication by certain licensed health professionals. An exemption in the Nurse Practice Act allows family members to administer medication in certain instances. This has been interpreted by some parties, including the New York State Nurses Association and SED, as being too narrow to apply to daycare settings. The Chapter instructs OCFS to promulgate rules and regulations establishing standards for the administration of medication by day care providers. Such rules and regulations will take effect April 1, 2004. A. 8997, Sanders; Chapter 419 of the Laws of 2003; This Chapter provides technical amendments to Chapter 676 of the Laws of 2002, which provides for the licensure of mental health practitioners. This measure provides a temporary exemption to employees of the Office of Children and Family Services to allow for a longer period of implementation. This roundtable was convened to explore the issue of whether pharmacists that practice in certain settings should be allowed to engage in the collaborative management of drug therapy. Currently pharmacists in certain settings, specifically federally administered veterans hospitals, may work in conjunction with physicians to evaluate and modify a patient's drug therapy. Legislation before the Committee would permit this practice in hospitals, clinics, nursing homes, medical facilities and home care agencies throughout New York State. The stated purpose of this legislation is to decrease errors associated with the administration of medication in such settings. Pharmacists would provide drug information services, reaction monitoring and drug protocol management, all of which have been proven to contribute to the reduction of medication errors. Members of the medical community have expressed concerns over certain aspects of this legislation. Components of the bill would allow for pharmacists to perform functions that, historically, could only be done by physicians and nurses. Such functions include ordering lab tests and modifying and managing drug therapy regimens. The roundtable was co-sponsored by Assemblyman Ron Canestrari, Chair of the Assembly Higher Education Committee and Assemblyman Richard Gottfried, Chair of the Assembly Health Committee. In attendance were numerous members of the healthcare community, including the Medical Society of the State of New York, the Pharmacists Society of the State of New York, the Health Association of the State of New York and various medical and pharmaceutical practitioners. Issues of particular importance, such as scope of practice, were discussed at length. The thoughts and concerns that were expressed by those in attendance will be helpful when the Committee considers this legislation. These hearings were convened in an effort to highlight the critical needs and priorities that would constitute a comprehensive capital plan for the State and City Universities. The SUNY and CUNY capital plans in previous years have invested billions on college campuses and benefited their communities throughout the State. This year, the Governor failed to provide specifics for a five year plan, resulting in a 2003-04 enacted budget with only limited capital funding. The Governor's budget proposal included new capital appropriations of $2.5 billion for SUNY and $1.1 billion for CUNY. During budget negotiations, the Assembly repeatedly requested the necessary information to properly analyze the proposal. Unfortunately, the Executive refused to provide that information, resulting in a deferral of significant portions of the Governor's plan. The lack of a comprehensive capital plan has left SUNY and CUNY unable to adequately address serious health and safety issues for students, faculty and other members of the college community or even provide basic maintenance. Important construction projects have been put on hold, leaving health and safety hazards uncorrected, eliminating valuable jobs, and reducing the quality of education SUNY and CUNY schools provide. On November 19th and 25th, 2003 the Assembly Majority held public hearings on the matter in Albany and New York City in an effort to raise public awareness of the issue and to encourage the Executive to provide details of the capital plan. With over sixty witnesses, these hearings were extremely well attended. Key witnesses included the Matthew Goldstein, Chancellor of CUNY, Robert King, Chancellor of SUNY, a panel of Presidents from various Colleges and Universities, a panel of faculty members, and several students from both the SUNY and CUNY systems. As the Committee looks ahead to the upcoming 2004 Legislative Session, many of the traditional goals relative to higher education and the professions will continue to have precedence. 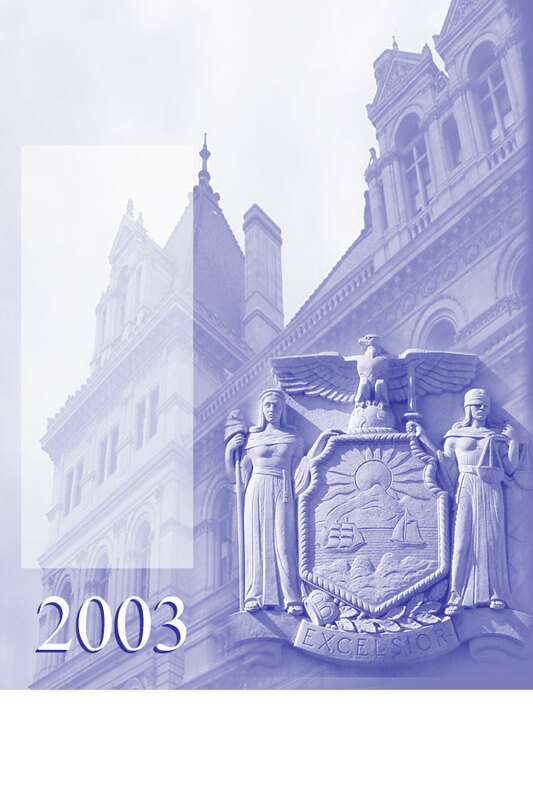 Foremost among the Committee's priorities for the 2004 session will be, despite the austere fiscal climate, to secure financing for the coming fiscal year sufficient to meet the demands of SUNY, CUNY and the independent sector and to support their unique missions. A vital component of this effort is the provision of a comprehensive capital plan for the SUNY and CUNY campuses. The broader goal of preserving access opportunities to higher education for students all across New York State is also a concern. By continuing to fight for increased funding for access programs, the Committee will promote the recognition of these highly successful educational services. As always, the Committee will continue to focus on TAP and ensure the availability of the Program at current, or enhanced, levels. The Assembly Higher Education Committee is proud of this comprehensive financial aid program and will fight to continue this Program's success in opening doors for college students throughout the State. In 2004, the Committee will also address several important legislative issues. Among these will be measures relating to the forty-four licensed professions overseen by the Department of Education's Office of the Professions. Chief among these will be initiatives aimed at preserving the integrity of the individual professions and ensuring that professional competence translates into increased public protection and safety. In addition, the Committee will continue to study the evolution of existing professions to assess the possible need for statutory changes to reflect the changing needs of consumers.